Pigment producer manufacture produces pigments to supply to paints, plastics, inks, construction, textile and cosmetics manufacturers etc. The pigments come under wide range - general purpose grades, high performance, and specialist hard-to make colours and effect pigments. Pigments and chemicals form an intrinsic part of many industries. They serve as raw materials in the manufacturing of Plastic, Rubber, Paint, Paper, Textile, Tiles, Detergent Powder and Soaps, Inks, and Photo Films etc. 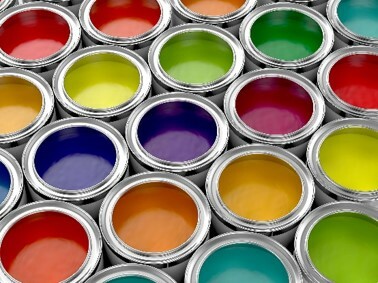 Pigments come in a wide variety of colours and some are water-soluble. For these reasons, many of these compounds have been produced, isolated, and characterized. Among the most important variables affecting processes, pH and temperature are environmental conditions with a strong effect on the pigments. Thus, it is very important to control them in industrial bioprocesses. The degree of acidity or alkalinity of a solution, known as pH, is measured from 0 to 14. Acid solutions measure 0 to 7. Alkaline (smells like ammonia) solutions measure 7 to 14. Pure distilled water measures 7. There are instruments to measure pH, or you can rely on sense of smell. The binder should have a slight ammonia odor. We are shooting for a pH range of 8.0 to 8.8. The acrylic polymer used to make paint becomes unstable at a pH below 7.5. Adding a dispersion may lower the pH below the optimum range. Also, adding thickeners will typically lower the pH. If polymer binder starts looking and acting like cottage cheese then chances are pH is too low. Try raising the pH to salvage the batch. Do this with the drop-wise addition of Ammonium Hydroxide (NH4OH) while mixing. If the mixture does not respond to the pH correction, allow it to dry out for disposal. 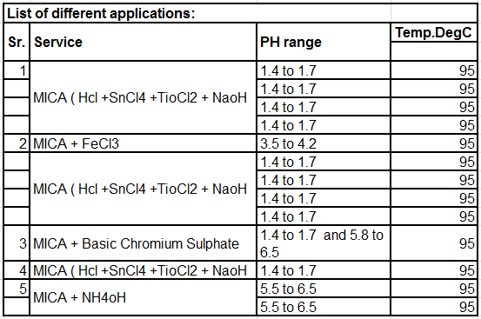 Ammonia is used to maintain the pH in the acceptable range. Ideally, this is determined with a pH meter, and is characterized by a slight ammonia odor. You will feel the mixture get thicker as you proceed. (If you are getting chunks it may be a result of adding the Thickeners too quickly or insufficient mixing.) Blend until the mixture is smooth and of the desired thickness. What is the concentration of these chemicals? Customer may say it is difficult to give concentration of these chemicals. What is the process pressure? Once in a day. Customer has observed drift of @1 PH every day i.e. why calibration is done daily. Use sensor with most chemically resistant Ryton body. 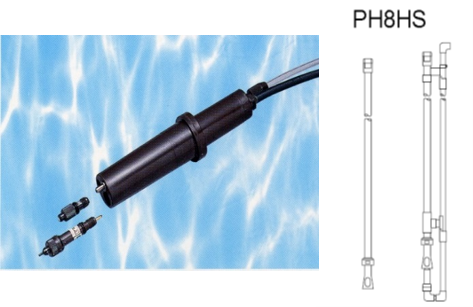 pH immersion fitting like PH8HS / equivalent with PH8EFP sensor. With the body made of Ryton, a strong engineering plastic, which is comparable to Teflon in terms of corrosion resistance and heat resistance, it allows for a wide range of applications. The integrated-sensor design simplifies calibration with standard solutions and maintenance. The pH glass electrode of a pH sensor, the platinum or gold electrode of a ORP sensor and junction can be individually replaced. More reliable and accurate analysis of pH which helps to improve end product quality and total operation cost is less. 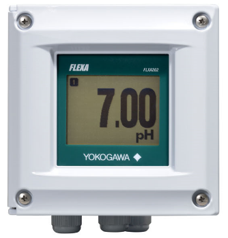 Yokogawa's pH and ORP analyzers are highly reliable. 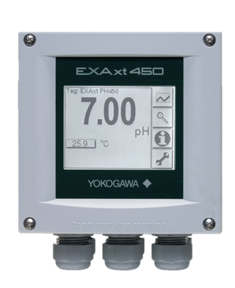 They feature advanced functions and are useful for a wide variety of applications including water quality management in a broad range of production processes and in medium-sized wastewater treatment plants, or as general pH and ORP control systems. pH and ORP meters, analyzers and transmitters are used for continuous process monitoring of pH and ORP to ensure water/product quality, monitor effluent discharge, batch neutralization, pulp stock, scrubbers, cooling towers, chemical, water/wastewater treatment and many other applications.